One of the first albums I ever owned was Heart’s Dreamboat Annie. I liked the songs, the music, Ann Wilson’s voice, and Nancy Wilson’s acoustic guitar. Now, after four decades and 30 million records, the Wilson sisters tell their story and I have a deeper appreciation for their albums. The Wilsons grew up the daughters of loving parents, but had a gypsy-like existence. Their dad was a Marine, which meant constantly moving and never putting down roots. They didn't have enough time to forge many friendships so the three Wilson sisters (Lynn, Ann and Nancy) were always very close. There is a lot of heart in the Wilson sisters' story. 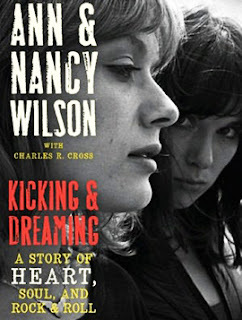 Kicking & Dreaming: A Story of Heart, Soul and Rock & Roll, published by Harper Collins, was written by Ann and Nancy Wilson with co-author Charles Cross (Heavier Than Heaven: A Biography of Kurt Cobain). Most of it is told through the perspectives of Ann or Nancy. 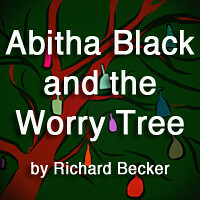 Some scenarios are told through the eyes of both, with slightly different memories. However, the book isn't limited to the sisters alone. Sue Ennis, best friend and songwriting partner, provides input too. Other past members of Heart also chime in from time to time. And it's these fine additions that help add depth. We learn that when the Wilson family finally did settle down for good in Seattle, Ann and Nancy were obsessed with the Beatles. They had seen them on the Ed Sullivan Show and did everything thing they could to see them live. But unlike most girls of their generation, they didn’t aspire to be rock band girlfriends or wives. They wanted to BE the Beatles. Music quickly took a serious turn in the seventies. In the early 70s, singer Ann decided to pursue music seriously and headed to Vancouver to join a fledgling band called Hocus Pocus, later renamed Heart. She hooked up with the band’s headstrong and svengali-like visionary, Michael Fisher, and lived with him for a number of years in a hippie/commune environment. It is Fisher who would eventually inspire some of Heart’s biggest hits, including Magic Man and Crazy On You. But before that, Heart paid their dues as a cover band, playing top 40 hits and plenty of Led Zeppelin. 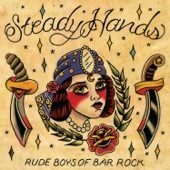 It wasn't until guitarist Nancy joined the band that they found a new dynamic. Heart was unique in that it was made up of two sisters and two brothers (Michael Fisher as the de facto leader and Roger Fisher as lead guitarist). It wasn't long before Ann and Nancy's songs started to spotlight the band’s repertoire. Magic Man earned airplay in Vancouver. And yet, they still had challenges, including misogyny. Women weren't readily accepted in rock and some people questioned whether or not Nancy's guitar was plugged in. Inside the band, the men wanted to remain in charge despite Ann and Nancy writing, singing, and playing their own material. The book is unabashed in covering their pain, struggles and successes. Some of them will surprise. For example, Elton John’s songwriting partner Bernie Taupin once tried to seduce Nancy at John’s birthday party. Alex and Eddie Van Halen invited Ann and Nancy for a romp in the same bed, which they politely declined. Nancy did, however, give Eddie an acoustic guitar after learning he didn’t own one. Even after they did reach the pinnacle of their careers, nothing came easy. By the 1980s, records sales were declining as outside influencers pushed them to become pop stars instead. They were recording songs that they didn't write for the first time (What About Love and These Dreams). Ann admits she especially hated All I Wanna Do Is Make Love To You, written by Mutt Lange. "She did sing it, and we begrudgingly turned it into a Heart song," Nancy wrote. "It ended up being one of our most controversial songs, even getting banned in Ireland and a few other countries." Ann shares her other struggles too. Not only did weight continue to be a life-long issue, but also alcoholism. Nancy is straightforward about her marriage and painful divorce from writer Cameron Crowe. Both sisters are candid about infertility (which runs in their family), which prompted Ann to adopt two children. Nancy had twin sons through a surrogate. 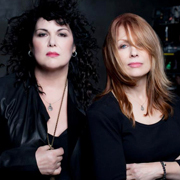 Kicking & Dreaming: A Story of Heart, Soul And Rock & Roll By Ann And Nancy Wilson Rocks With 8.7 On The Liquid Hip Richter Scale. The book is candid and shows just how tight the Wilsons really are. With them, family truly does come first. It had to. The sisters frequently talk about failure, vulnerability, and humiliation. But what is different is in the timing. Their story is one of two women who are told there are rules. As many people know, they did everything they could not to follow them. You can download Kicking & Dreaming on iBooks or find Kicking & Dreaming: A Story of Heart, Soul, and Rock & Roll on Amazon. The autobiography is also available at Barnes & Noble. The audiobook is read by Ann and Nancy. 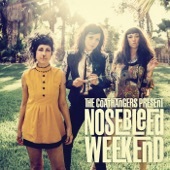 Just recently, Heart released its newest addition, Fanatic, which was mastered with iTunes in mind.